I seem to be sewing in multiples lately. It sure does make it go fast. Or so I told myself as I splurged on some black friday weekend fabric deals (I used so much fabric last week, right?!). 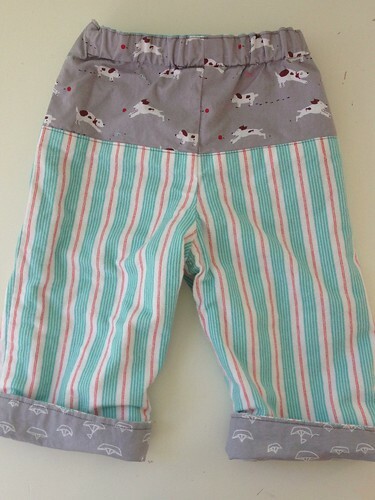 First up are quick change trousers. After the first pair I decided they are my favorite baby thing ever. They are, of course, from the Anna Maria Horner book, Handmade Beginnings. I have no idea how many I've made, but I'm most certainly in double digits by now. 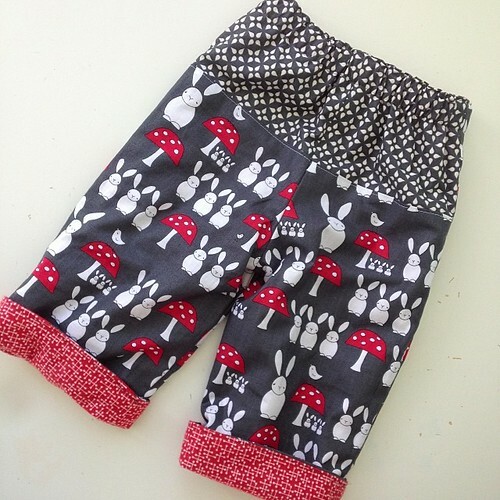 First (this round) I made them in this cute little rabbit print from Creative Thursday. Lined in a red flannel from moda and accented with a charcoal print from Rashida Coleman Hale's Washi line. 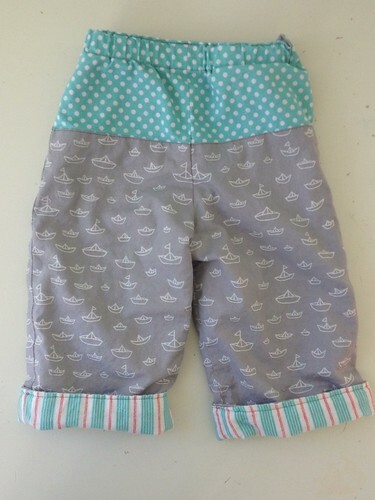 This time I used cute little boats from Cloud9 fabric and striped flannel from Sarah Jane's Children at Play line. Some Sherbet Pips dogs on the back of the reverse from Aneela Hoey. I pulled fabrics for a few more pairs for Sean but then the weather turned warm and the urgency passed. Seems like that will be remedied soon enough, though! My next venture was making Open Wide Zip Pouches from the Noodlehead tutorial for all the ladies in my family for Thanksgivukah. Andrew's family is Jewish and we were having Thanksgiving at his parents' so I figured since it was the second night of Chanukah I should come bearing presents. I had great fun, and made a great mess, pulling fabrics for these. I had exactly the right number of zippers in my stash long enough to work, so fabric choices were built around zipper colors. They came together surprisingly fast. Henry Ford was on to something with this assembly line thing! 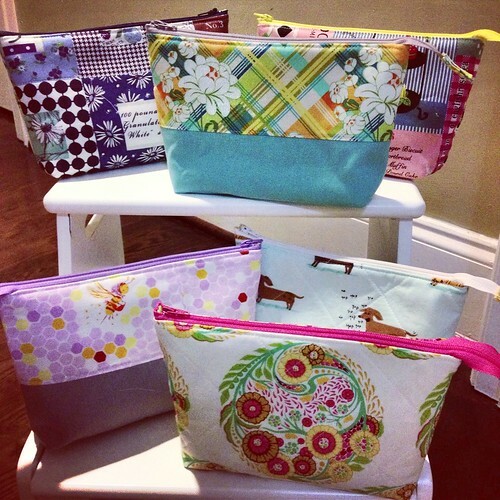 I am going to order more zippers now so I can whip up some for the teachers. Hopefully a nice gift with a gift card tucked inside. I kind of like the crunch of "can I finish installing 6 zippers before dinner." So, the only downside to really last minute gifts is bad cell phone pics! Does anyone have any other tutorials you like to use for assembly line gifts? I'd love to hear some good ones! How wonderful! Love the pants. They are fun to make. Your pouches are great. I need to try one. I just assembly lined 12 thread catchers from the all people quilt site. Very fun! All these are so cute. I must give them a try. oooh, oooh, oooh, the baby picture! 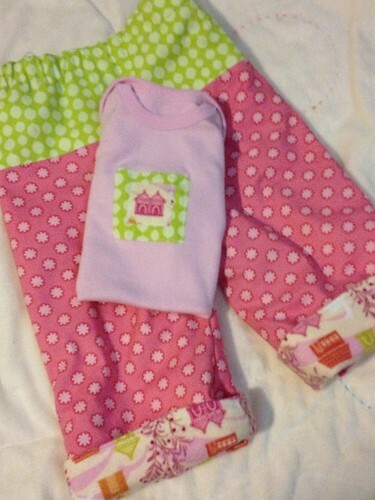 I love those baby pants, especially in the Creative Thursday print. I've never made a pair of those yet, but I can feel it coming!!! First of all, I am completely distracted by the baby :) Second, I'm loving those pouches. I'm in search of a gift for teachers and I think you've sold me on these! Love the pants and the pouches! But mostly I love the baby!! He is so cute. We haven't seen pictures of him for ages. Those little trousers are gorgeous. Are they reversible?